What is the most can’t-miss feature in CamScanner? OCR (Optical Character Recognition) feature! Make your life easier in different ways. What will you do if you want to excerpt a paragraph from book? What will you do if you want to edit text in a picture? OCR feature will help you extract and organize useful information from paper documents, turning pictures into editable text format, doing quick digital search and accessing information anywhere you want in a few steps! 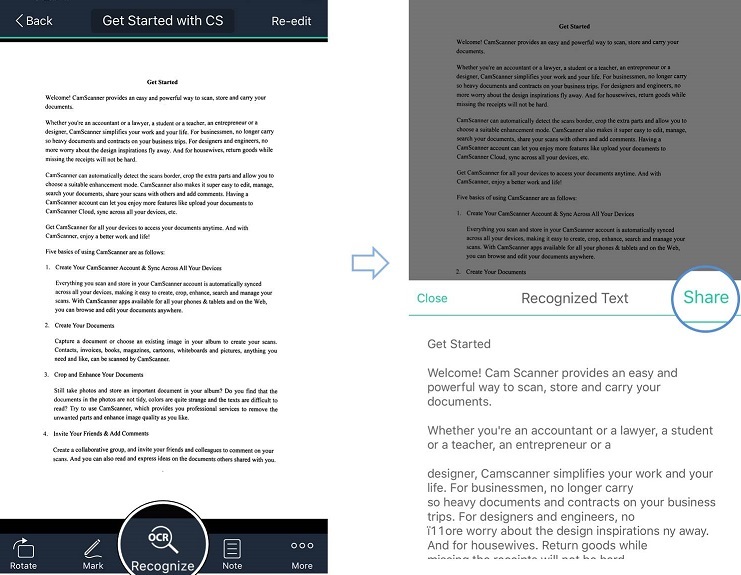 Posters, contracts, slides, essays, magazines…anything you want to save and edit can be done by CamScanner OCR feature. Text extraction is one of important features that OCR provides. To reduce the burden that people have to carry daily, OCR allows users to extract information from paper materials and edit directly through their smartphones and tablets. After extracting words from pictures, users can export them and then edit. Making PDF document editable is also possible. When users get documents in PDF format, taking pictures of them and using OCR to convert them into Text format will help users make documents editable. Then people can edit their documents in their smartphones or tablets or export them to laptops. How can you reach your desired documents instantly in a mass of files? OCR for search is an advanced way to find a document other than using tags and document names. After scanning tons of documents into CamScanner, you must be anxious about finding your needed documents in such a big mass. OCR will help you! After registering CamScanner, all the documents you scanned will be auto-recognized by our OCR feature in the backstage. When you want to find a certain document but do not know the exact file name, typing the key words that you remember within that document, all the documents that containing the key words will be listed on screen immediately, whether the word is in the title, doc image or notes. In our upcoming version 4.0.1, new feature “OCR region recognition” is available to our Android premium users (IOS version is coming soon). 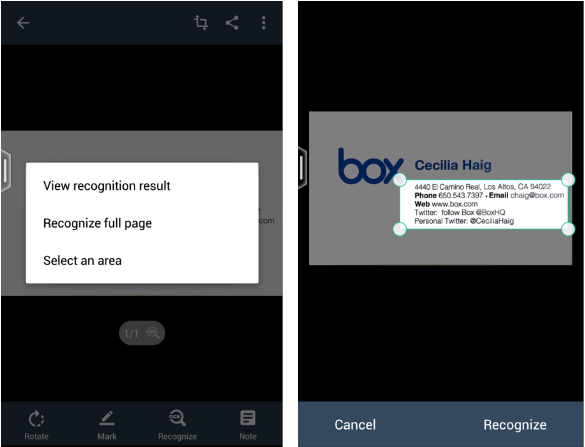 OCR region recognition allows CamScanner users to select a desired area and provides users with f the document, users can transfer their desired part into text format, export, a more accurate recognition result. Getting the rid of the unimportant part of the documents, users can transfer their desired part into text format, export, edit, or share with their friends, colleagues, and business partners. Feel excited about our OCR feature? Open the app and have a shot!